In a prior perspective piece entitled “International Reserves – Savings gluts can last only so long,” we laid out the foundation for higher interest rates in the United States based on the depletion of foreign FX reserves. 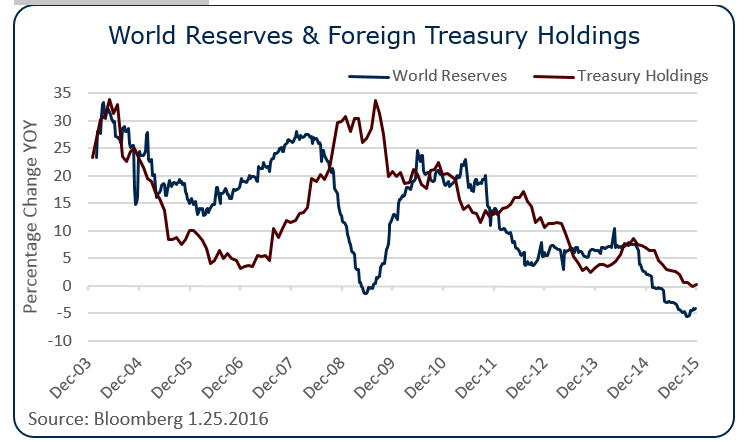 Global reserves turned negative on a year-over-year basis in the middle of 2015 (blue-line in the chart below). In spite of this and the strong correlation of foreign treasury holdings (red-line), ten-year treasury yields have remained stubbornly low. Many market pundits have theorized that central bank selling pressure in treasuries will be offset by a “risk-off” trade domestically. The argument is that during times of market uncertainty where emerging market governments are grappling with slow economic growth, a flight of capital, and weakening currencies, there is a burgeoning demand among investors and asset managers for treasuries. This demand naturally offsets the selling pressure by Central Banks as they try to stem their currency devaluations by buying their domestic currencies (selling dollars and U.S. treasuries). 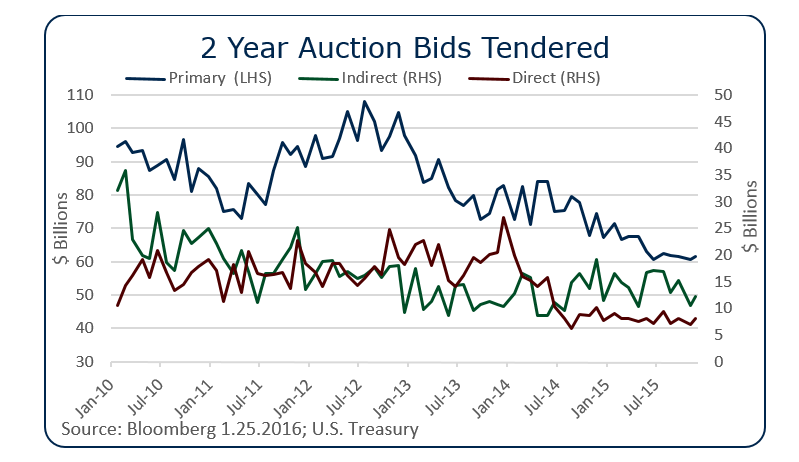 This paper analyzes trends in U.S. treasury auctions to see if this is indeed happening. The above chart further decomposes the demand-side of these auctions by tracking the amount of direct, indirect, and primary dealer bids at each auction. 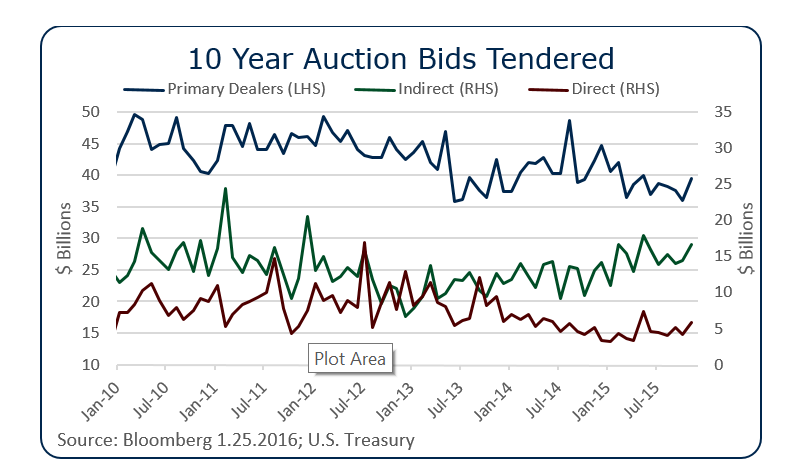 Primary dealers provide the bulk of the demand, however, over the last three years, primary dealer tenders (blue-line) have declined from a peak of over $100 Billion to just over $60 Billion. Direct tenders (red-line) have declined from around $25 Billions per auction to just above $5 Billion. And finally, indirect bidders or foreign entity demand (green-line), has declined but appears more stable. Over the last three years, it has been range-bound between $10 Billion and $20 Billion per auction. These results suggest that rising short-term yields are more a function of curtailed deal demand, than a drop-off in demand from foreign Central Banks- a curious finding given that every time there is a spike in short-term yields, anecdotal references blame the PBOC. This evidence doesn’t support that notion. Longer-dated treasuries have been even more resilient, currently just above two percent, and having briefly breached that level last week. 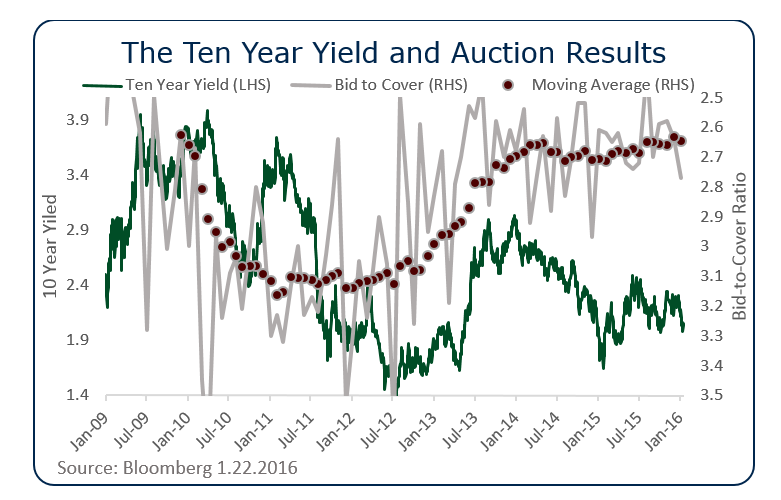 The above chart shows the ten-year yield against the bid-to-cover ratios at every ten-year auction over the last seven years. Again, the right axis is inverted. As bid-to-cover ratios rise, the ten-year yield tends to fall, and vice versa. Interestingly, over the past couple of years, the bid-to-cover ratio has been in a relatively tight range, between 2.6 and 2.7. It has yet to breakdown from these levels, like the two-year auction has. 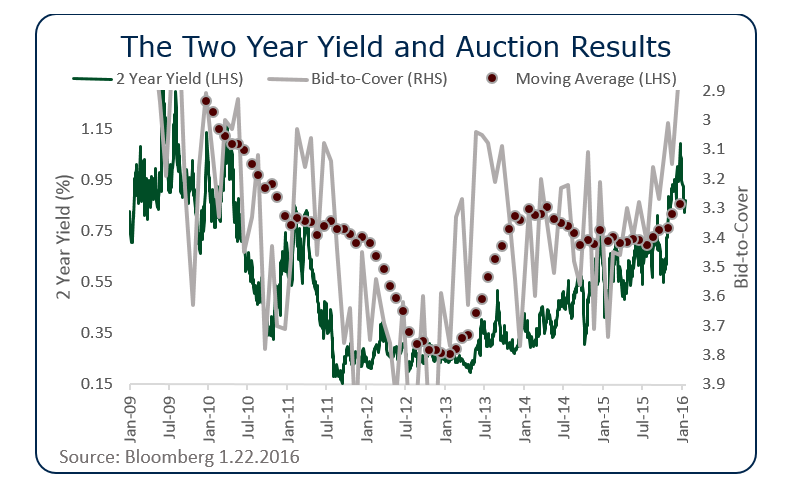 Also, in the face of this steady auction demand, yields have continued to move lower, from their high at the beginning of 2014 of three percent to the current two percent level. The treasury curve has been flattening, so it makes sense that auction demand for shorter dated treasuries would be less robust than longer maturity auctions. However, the often cited reason for increasing short-term yields due to PBOC and other foreign central bank selling is not accurate. Foreign demand for treasuries has held up relatively well in the face of declining FX reserves. I still think that this poses a threat to rising yields in the future, especially since the year-over-year change in foreign treasury holdings only just recently hit zero percent (chart 1), but this has NOT happened yet. Whether an increase in domestic demand could offset such a drop remains to be seen. However, given the waning primary dealer tenders at recent auctions, I doubt it. In any case, I will be paying close attention to the 2016 auction results, with particular interest in both the bid-to-cover, and the indirect tender.